New world super-bantamweight champion Carl Frampton wants WBA title-holder Scott Quigg to be his next opponent. Frampton produced a clinical display to beat defending IBF champion Kiko Martinez in front of 16,000 fans in Belfast's Titanic Quarter. 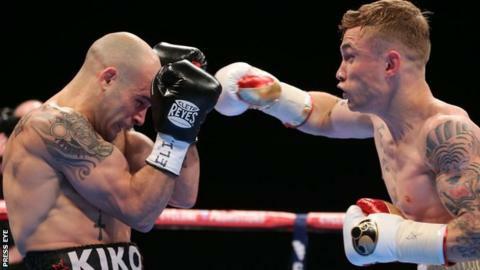 Carl Frampton talks about beating Kiko Martinez to win the IBF super-bantamweight championship. "The only man I want to fight is Scott Quigg," said the Belfast fighter after his unanimous points victory. However, Frampton's next fight to set to be a title defence against IBF mandatory challenger Chris Avalos. The 24-year-old from California is expected to get his title shot against Frampton next spring. Frampton told BoxNation that he was prepared to fight the undefeated Quigg (W28, D2) in England. "I'll fight him in Manchester, I'll fight him anywhere. What Eddie Hearn (Quigg's promoter) needs to remember is I'm the one with the legitimate belt." "I'm the one who brings the fans," added Frampton, while his manager Barry McGuigan said: "Scott Quigg will draw 800 people in Bury. We had to build an arena to fit in all Carl Frampton's fans." McGuigan also believes a fight against WBC champion Leo Santa Cruz would offer "real gravitas". Frampton (19-0) dedicated the victory to his grandfather, who died recently, and praised Martinez after a tough encounter. "That was for my grandad - I love you," he said. "Martinez was so dangerous. He's a hard puncher. I haven't seen my face yet but it feels lumpy. "I've never respected a fighter as much in my life. What a fighter and what a worthy world champion." McGuigan, whose son Shane was savouring success as the winning trainer, generously said of Frampton: "He's twice the fighter I was. He's going to be something really special."